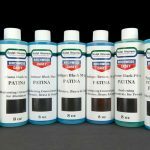 Patina stains are blended to match chemical or traditional patinas, but are easier to apply and manage. Because the patina stains include a blend of our Solvent Dyes and sealer, they are UV stable. 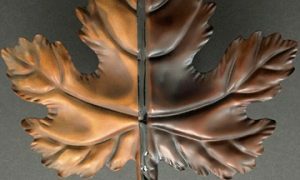 These stains may be sprayed, brushed, or rubbed on any metal. They may be thinned to produce a lighter shade. 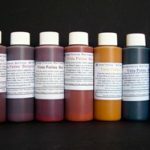 Patina stains are blended to match chemical or traditional patinas, but are easier to apply and manage. Because the patina stains include a blend of our Solvent Dyes and sealer, they are UV stable. These stains may be sprayed, brushed, or rubbed on any metal. They may be thinned to produce a lighter shade. For best results, over-spray with Clear Guard after application. 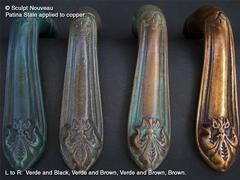 The stains are available in Black (looks like gun bluing or PC9), and Brown (oil rubbed bronze) and Verde (green). 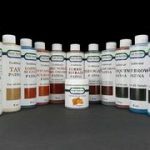 For more information about patinas, use these links to download a Patinas Overview or download detailed instructions on how to use patinas and other Sculpt Nouveau products. Click here to see a flow chart mapping the patina and finishing process from start to finish. Click here to view a video demonstration of this and many other products.